3. Credit Hours: 4 - Meets 6 PM till 9:20 PM on Mondays beginning January 13, 2003. Meets in Forest Park Room G-412. Students will work with digital type and text, graphics, photographs, video, and sound using current authoring software (Macromedia Director 8.5) to produce computer and Web hosted multimedia. In the process students will learn to incorporate the various hardware and software tools required, as well as best practices in a production environment. Attention will be devoted to various multimedia delivery options including compact disc (CD-Rom) and the World Wide Web. Course Prerequisites: MCM:135 or permission of the Instructor. Zip Disk formatted to your platform of choice. Lab has 10 PC's and 10 G4 Macs with Director loaded. Access to a lab with an Internet connection. In this case Forest Park G-412. Check door for lab hours. Text/CD: Director 8 Demystified by Jason Roberts/Phil Gross. PeachPit Press/Macromedia Press 2000. Available in the FP campus bookstore. Students will learn to plan (storyboard) a multimedia product. Students will learn to edit and prepare text and type for appropriate inclusion in multimedia products. Students will learn to edit and prepare graphic elements for inclusion in multimedia products. Students will learn to edit and prepare digital images for inclusion in multimedia products. Students will learn to optimize audio files for inclusion in multimedia products. Students will leam to optimize video for inclusion in multimedia products. Students will learn to use authoring software to complete a multimedia presentation appropriate for training, presentation, education, or advertising. Students will edit and include text in a multimedia product. Students will edit and include graphics and or photographs in a multimedia product. Students will edit and include sound and or video in a multimedia product. Students will edit and include music in a multimedia product. Students will use authoring software to complete a multimedia product. Students will place their completed multimedia project into a finished form appropriate for delivery. Attendance: 3 points deducted for each absence!!! Excused absenses are a rarity. Testing: Students' grades on online quizzes will be averaged into their semester grade. Tutorial completion will be considered a part of the testing procedure. Projects: Students will complete a semester long laboratory project to create a finished multimedia product ready for delivery. Remember , 3 points will be deducted per unexcused absence. Your attendance is the single most vital predictor of your success in the course! Voicemail : 314-595-2060. Please leave a message by phone or e-mail (better) if you cannot attend class. All students registered in this class have the option of using the computers in the Campus Computing Center Room D-300 (no Director there) and this room (G-412). Hours are posted on the door of G-412. 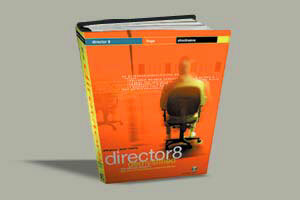 Need a demo copy of Director? check out http://www.macromedia.com/software/trial_download/ I recommend a version of 8.5 to insure compatibiity with the Lab machines.